Rolf Czabayski is the first Australian to achieve an IGFA Royal Billfish Slam—a feat that took him 34 years and trips to Hawaii, Florida, St Thomas, Cape Verde, Dominican Republic, and Mexico. He also holds the IGFA men’s 15 kg (30-pound) line class record for a white shark that weighed 699.5 kg (1,542 pounds). Rolf is a frequent angler in the Cairns heavy tackle fishery for black marlin; he has competed in the prestigious Lizard Island Black Marlin Classic as well as the Hawaiian International Billfish Tournament. In the 53rd HIBT in 2012, fishing with son Ralph Jr., he caught an 82 kg (180 3/4 pounds) blue marlin that swam 1,742 nautical miles to win the IGFA Great Marlin Race. 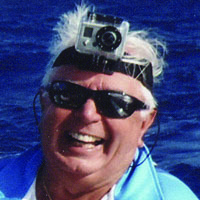 Czabayski served four terms as President of the Game Fishing Club of South Australia, currently serves as Secretary, and has been a member of IGFA’s International Committee of Representatives since 2010.